Big animals. Big adventure. BIG FUN! Explore 106 acres of wildlife adventure at the largest zoological experience in Texas! The Dallas Zoo is home to many rare and endangered species. Don’t miss the ExxonMobil Endangered Tiger Habitat with Sumatran and Indochinese tigers. Let the little ones have fun at the Lacerte Family Children's Zoo with a petting zoo, pony rides, running stream, and the popular Nature Exchange. Check out creeping, crawling Texas bugs at the new Bug U! exhibit and have an otterly wonderful time watching the antics of the Asian small-clawed otters at the Betty Moroney Norsworthy Otter Outpost. Named the best African zoo exhibit in the nation by "The Zoobook: A Guide to America's Best," the Dallas Zoo's "Wilds of Africa" is a 25-acre tract featuring the six major African habitats. Take the Monorail Safari for a 20-minute tour that travels through forest, river, woodland, desert, mountain, and bush habitats. Get a monkey’s-eye view of lowland gorillas, saddle-billed storks, zebras, okapi, baboons, and other species. Live educational narration during the ride adds to the sensation of being on a real safari. The Dallas Zoo Monorail Safari operates seasonally from March 1 to June 15 and the Friday before Labor Day to Dec. 1. Later, walk along the Nature Trail and get an up-close view of the Jake L. Hamon Gorilla Conservation Research Center, the Kimberly-Clark Chimpanzee Forest and more. Founded in 1888, the Dallas Zoo was the first zoo in Texas and it is the largest in the Southwest with 95 acres of developed land. It is a member of the American Zoo and Aquarium Association. 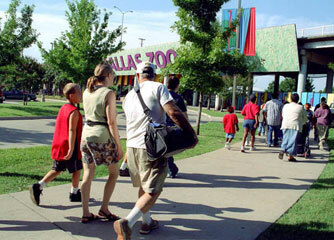 For current admission prices and hours of operation, please visit DallasZoo.com.